More than 120 island scattered in the Lingayen Gulf have been made famous for their distinctive, picturesque cluster. 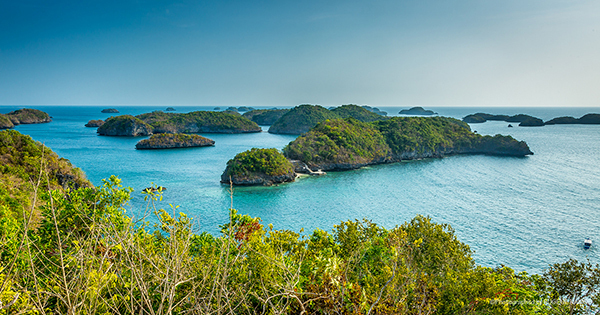 Generally known as the Hundred Islands National Park, this protected area is located in Alaminos, Pangasinan about 5 hours away from the Philippines' capital city of Manila. Some adventurous tourists opt to camp overnight on the allowed camping sites on the island but there are also many hotels near the area that tourists can choose from. #1 - Nautilus Islands View Lodge: Formerly known as the Hundred Islands Resort Hotel, this family-owned lodge is close to the Lucap Wharf and the national park. With free WiFi access in every part of the area, a beautiful garden, restaurant, comfy air-conditioned accommodations with a clean attached bathroom, and Hundred Islands tour packages, guests find it an excellent choice. #2 - Monte Rio Gardens Bed & Breakfast: Although located in the heart of the town, Monte Rio offers a private facility with few exclusive rooms. From a standard room for two persons to two family rooms for up to ten persons to two deluxe rooms for up to 4 persons that has a complete kitchenette set, they have just the right room for you at a reasonable price. #3 - Bamboo Paraiso: A beachfront resort in Alaminos, Pangasinan, this resort offers fan room accommodations in bamboo huts for up to 4 persons. The Hundred Islands is about 15 minutes of boat ride away from the resort and the staff would happily set up the boat trip for you. There were not many facilities in the resort but the nature, peace, and hospitality of the people would surely suffice. #4 - Maxine by the Sea Restaurant and Lodge: Mainly visited because of their restaurant that serves authentic Filipino and International cuisine from the freshest seafood catch, Maxine by the Sea also has 16 fully airconditioned and spacious rooms and pavilion that can accommodate up to 250 persons. Its proximity from the islands gives a panoramic view of it, especially in the sunrise.